Thank you for your trust in our company and for buying the new Energy Headphones BT Smart 6 Voice Assistant. We hope you enjoy them. Do not expose your Energy Headphones BT Smart 6 Voice Assistant to impacts, dust, humidity or high temperatures. Do not disassemble your headphones. All reparation works should be carried out exclusively by qualified staff of Energy Sistem Technology, S.A.
Headphones that work with your smartphone's voice assistant to easily select smartphone functions. Bluetooth 4.2® to play music wirelessly. Rechargeable lithium-polymer battery with up to 23 hours of battery life. Rotating ear pad system to enjoy even more comfort. If you prefer to use the cable to play music or you don't want to use the battery of your headphones, plug them into the device using the audio cable. To turn on your Energy Headphones BT Smart 6 Voice Assistant, press and hold the MULTIFUNCTION BUTTON (2) for 2 seconds. You will hear a confirmation sound and the STATUS INDICATOR (1) will glow blue. The STATUS INDICATOR (1) will keep flashing blue while your Energy Headphones BT Smart 6 Voice Assistant are on. To turn off your Energy Headphones BT Smart 6 Voice Assistant, press and hold the MULTIFUNCTION BUTTON (2) for 2 seconds. You will hear a sound when turning off the headphones. When the battery level is below 10%, the STATUS INDICATOR (1) will flash red and you will hear a sound to remind you to charge the battery. The STATUS INDICATOR (1) will glow red while charging the device and will turn blue once the charging process has been completed. Plug the microUSB end of the USB cable provided to the CHARGING PORT (5) of your headphones and the other USB end to any device with an USB charging port that provides energy (PC, USB wall charger, car charger, etc) to charge the battery. The charging time is approximately 3 hours. Once your Energy Headphones BT Smart 6 Voice Assistant are off, press and hold the MULTIFUNCTION BUTTON (2) for approximately 4 seconds, until the STATUS INDICATOR (1) starts flashing red and blue. At this point, your headphones and your Bluetooth device can be paired. 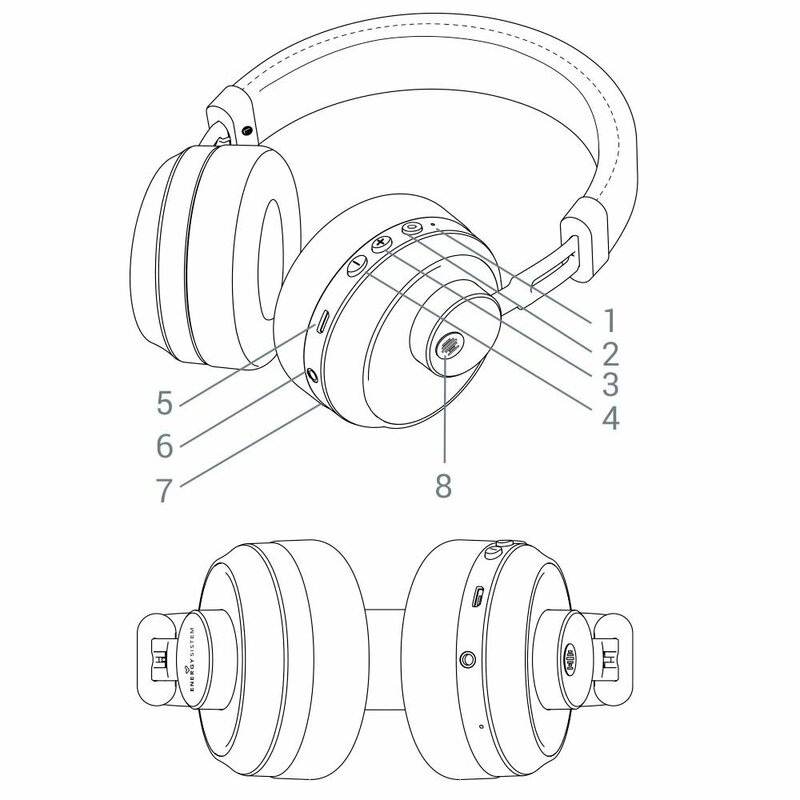 Once "Energy Headphones Smart 6" appears on your devide screen, press "connect". You will hear a sound that confirms that both devices have been paired correctly. If you previously paired your Energy Headphones BT Smart 6 Voice Assistant with a device, they will connect automatically next time you turn them on. In case that you want to pair them with another device, repeat the pairing process (press and hold the MULTIFUNCTION BUTTON (2) for 4 seconds). Once your Energy Headphones BT Smart 6 Voice Assistant are syncronized, you will be able to control basic playback functions such as turning up and down the volume and switching to the next or previous song directly from your headphones. Press VOLUME + (3) and VOLUME - (4) to turn the volume up and down respectively. You will hear a sound when reaching the maximum and minimum volume levels. Press and hold NEXT (3) to switch to the next song. You can also press and hold BACK (4) to go back to the previous song. Press the MULTIFUNCTION BUTTON (2) once to pause or resume playback. If you are using the audio cable instead of the Bluetooth connection, you will have to use your music player to control music playback and not the headphones. Once your Energy Headphones BT Smart 6 Voice Assistant and smartphone are synchronized, you will be able to answer calls thanks to the built-in MICROPHONE (6) while wearing your headphones. Press the MULTIFUNCTION BUTTON (2) to answer an incoming call. If you are listening to music when you receive a call, playback will pause and you will hear an incoming call sound. Press and hold the very same button for 2 seconds to reject an incoming call. Press the MULTIFUNCTION BUTTON (2) again to end a call. Playback will resume from the point when the music stopped. 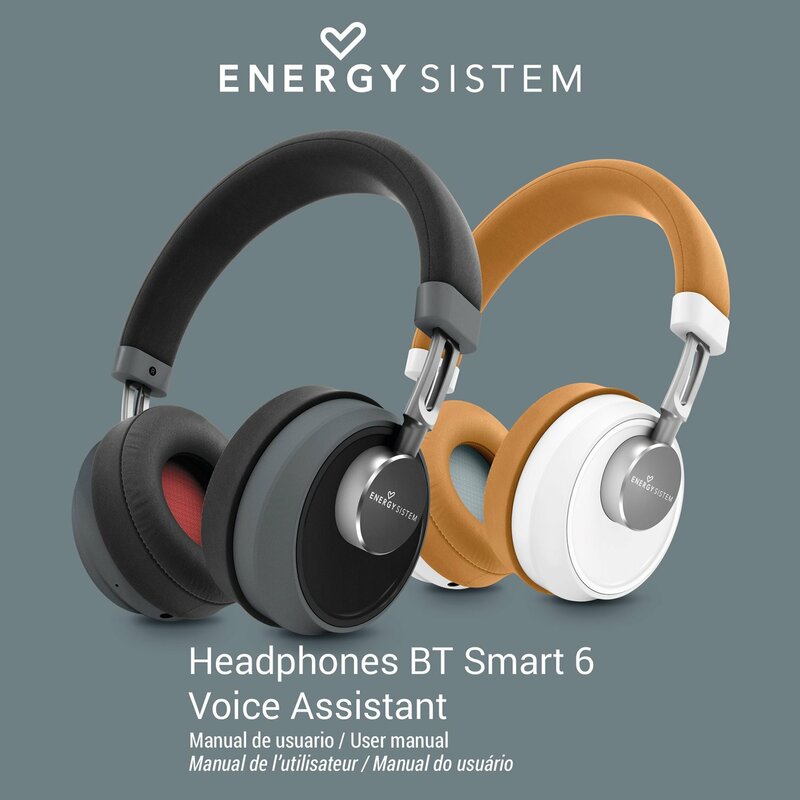 Your Energy Headphones BT Smart 6 Voice Assistant feature an ASSISTANT BUTTON (8) that allows you to directly activate your smartphone's assistant. This function will activate your smartphone's digital assistant and will let you use voice commands to perform tasks naturally and easily. Please take into account that the ASSISTANT BUTTON (8) activates your smartphone's voice assistant and depends on it to perform actions. 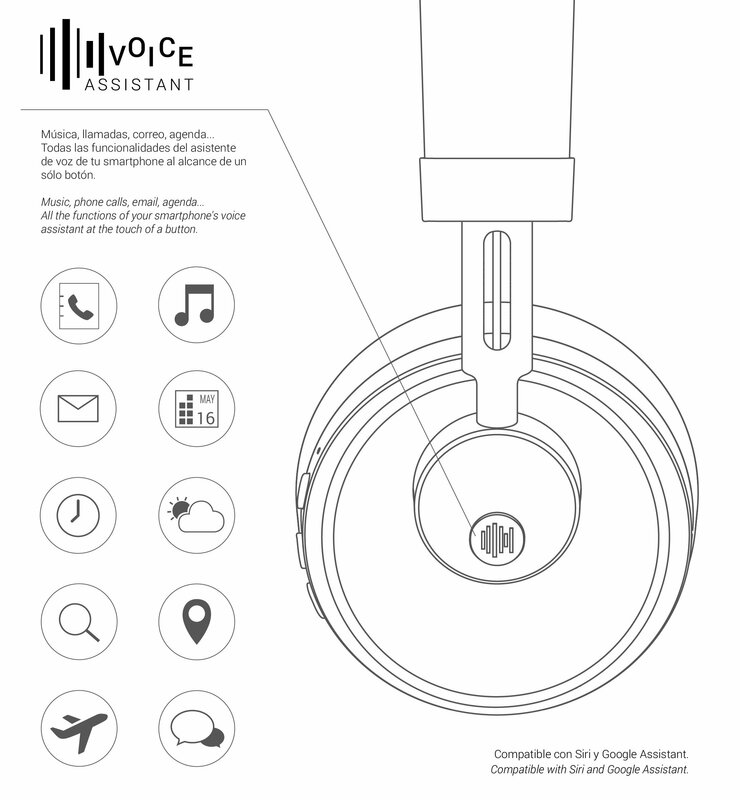 You can also take a look at Google Assistant and Siri user guides, available on their manufacturers' websites. If you don't want to use the Bluetooth connection, you can also connect your Energy Headphones BT Smart 6 Voice Assistant to your music player using the audio cable provided. You don't need to switch your headphones on if you want to use the audio cable. Simply plug one cable end into the AUDIO INPUT (6) and the other end to your music player to enable this mode. *Please take into account that the Voice Assistant feature will not be available if you're using the audio cable.